"Rebecca Hamilton fans, take heart! Your thirst for paranormal adventure and suspense as only Hamilton can brew it can now be quenched. 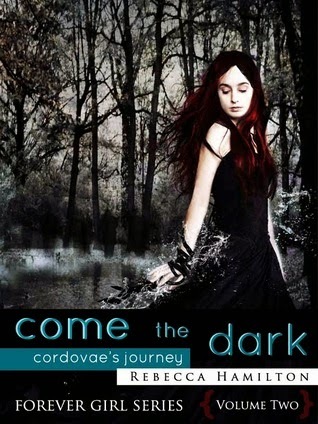 COME THE DARK is here and it was well worth the wait. As an ardent fan of The Forever Girl Series, I was admittedly anxious. I’d been following the progress of this book on Hamilton’s blog and Twitter feed and was thrilled to receive an ARC copy for review. This is the story of Rose, a young woman suffering an illegitimate birth at the hand and deed of her own father. It’s 1961 and there aren’t many choices for girls like Rose, especially in the Georgia countryside. Escaping is the only way to freedom. Freedom from among other things – The Dark Ones who haunt her life. But after fleeing Rose finds herself living in Salem in another time period with memories that tickle the edges of her mind, and a brand new name – Cordovae. These fragmented memories are soon confirmed by those around her – including a strange man and woman – William and Tess – who she meets in the woods. The journey these three take together is fraught with battles against forces of evil determined to bring them down. There is adventure and intrigue and plenty of it. And as the saying goes where there’s smoke – there’s fire; a romance doomed to fail yet blooming all the same. I was immediately immersed into this tale. Hamilton’s writing has a uniquely magnetic tone. As a reader you are compelled to turn the pages and keep turning. I found it hard NOT to continue reading. She feeds the pages with gorgeous scenes that are so grounded in rich detail that I felt as if I was walking in the fields and brush along with the stars of the story. I do not refer to them as characters. This is because Hamilton writes people with all the rounded-out traits of the flesh. You will know them intimately and want to continue knowing them for life. I felt such a deep connection to Rose/Cordovae (who is also Abigail) that I’m certain she will remain one of my literary faves for years to come. I fell for this book. Hard and fast. I read it in just a couple days and then re-read it again. I’m limited to leaving only five stars but my affection for this book far supersedes those stars. In a large sea of paranormal fantasy, COME THE DARK shines like only a true gem can. ***** "